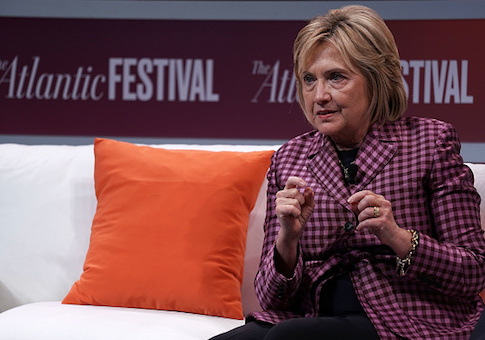 The political action committee associated with a dark money nonprofit organization launched by failed presidential candidate Hillary Clinton raised a paltry $42,000 during the third quarter, Federal Election Commission filings show. Clinton's PAC, the Onward Together Committee, was created to fund Democratic candidates in hopes of regaining control of the House of Representatives. The PAC was launched alongside Onward Together, a New York-based 501(C)(4) "social welfare" nonprofit she founded to be a part of the "resistance" following her loss to Donald Trump. The Onward Together Committee reported just $42,326.37 in donations from July 1 to Sept. 30, its October quarterly filings show. The committee disbursed around $70,000 in contributions to Democratic candidates during this time period. Debbie Mucarsel-Powell, a candidate in Florida's 26th Congressional District, Antonio Delgado, a candidate in New York's 19th Congressional District, and Donna Shalala, a candidate in Florida's open 27th Congressional District, were among those who received money from Clinton during the last three months. Clinton's PAC sent $130,000 in contributions to Democratic candidates as of the end of the second quarter of this year, which spans from April 1 to June 30, much of which went to Democrats in "toss-up" districts such as Susan Wild in Pennsylvania's 7th Congressional District, Scott Wallace in Pennsylvania's 1st Congressional District, Katie Porter in California's 45th Congressional District, and Jennifer Wexton in Virginia's 10th Congressional District. The PAC also sent money to the likes of the Congressional Black Caucus PAC and the Congressional Hispanic Caucus's BOLD PAC. Clinton's committee has now raised a total of just under $400,000 throughout the election cycle. In the Spring of 2017, Clinton launched "Onward Together" in an attempt to stay active against Trump. Its nonprofit arm is used to assist other liberal organizations, many of which partake in direct action against Republicans. Clinton pushed $800,000 from her leftover campaign funds to the nonprofit shortly after its formation. The nonprofit has taken in millions from the Democratic National Committee and Democratic Congressional Campaign Committee for its email lists. While the group has yet to file its tax forms, an employee with the organization previously told the Washington Free Beacon that Clinton had sent out over $1 million to other "resistance" groups last year. Six months after her defeat, Clinton also began disbursing "rent" payments from her campaign to a limited liability company, ZFS Holdings, which was established years prior to manage her book and speaking income. Clinton has since made $150,000 in such payments to the Delaware-based LLC. Nick Merrill, Clinton's spokesperson, told the Free Beacon that the payments were made to Clinton's LLC because the space served as a campaign wind-down office, Clinton's personal office, and an office for Onward Together. Clinton's PAC did not respond to a request for comment on its lackluster fundraising haul. This entry was posted in Politics and tagged 2018 Election, Hillary Clinton. Bookmark the permalink.